← Show and Tell time! I am a person who has always appreciated art in any form. It is wonderful to see what people can create from nothing, a piece of fabric, plastic bags, paints and inks a lump of clay. As a child I wondered at the HOW, how did they make this, what tools were used? It was the pieces where you could feel the emotion behind them, see the careful craftmanship that made me want to learn and create myself. Learning from other artists is key, playing with your techniques is fun and can lead to wonderful explorations but tried and true advice from other artists can save you a lot of time, materials and effort. Taking the time to really craft my work is sometimes hard, but I labor over it and a mini album can take me weeks to complete. I adhere to the old adage that if something is worth doing then it’s worth doing well. So, to my friends that are reading these sometimes lengthy blog posts, I offer you a pearl of wisdom. Set aside time for your work. Don’t just squeeze it in at 5:30 in the morning! Do not, I repeat DO NOT, create art while still sleeping…..
great advice!! I find that my best work is not done under a time line or during certain hours. I have to really fell the need to craft in order to do my best. ROTFLMAO!! Ohhhh nooooo!!! hahahahaha oh sorry… hahahahha… I’m crying I’m laughing so hard! THIS is something *I* do Leslie!! Not you!! LOL …..
I’m sure you will find a way to cleverly fix it… or hey… come up with a great picture to go with it!! Oh man… I’m going to have to fix my make-up now. I’ve cried it all off in laughter. I have come up with a solution to both cleaverly conceal it, and be able to keep it for my long time viewing pleasure (and that of my family who have all insisited it be left as is!) It totally stumped me last night though. I couldn’t work on the album at all!!! I may do a lot of things while I’m still sleeping, but creating my art is definitely NOT one of them, lol. Completely agree with you Leslie – it’s ALL about the emotion that goes into your creations. If you put yourself into your creations, others can see and feel it. The opposite holds true as well. I think some of you may be missing this….. 🙂It sure took me long enough to see it and I made the glaring mistake! LOL!!!! Awww, got it this time, LOL!!!!! Are you kidding Leslie?? How great to know I’m not the only one who makes oops!! And I’m AWAKE when I make mine, LOL!!! I so some of my best work at 4am….but I’ve never been quite this tired. So Funny! Thanks for the laugh!! I must need a nap because it took me a good long while to figure out what the problem was. LOL! All you can do is laugh! Love it that you shared it with us! oh my!!! LMBO….. I would love to have noticed this the first time I viewed it !!! Too funny!! 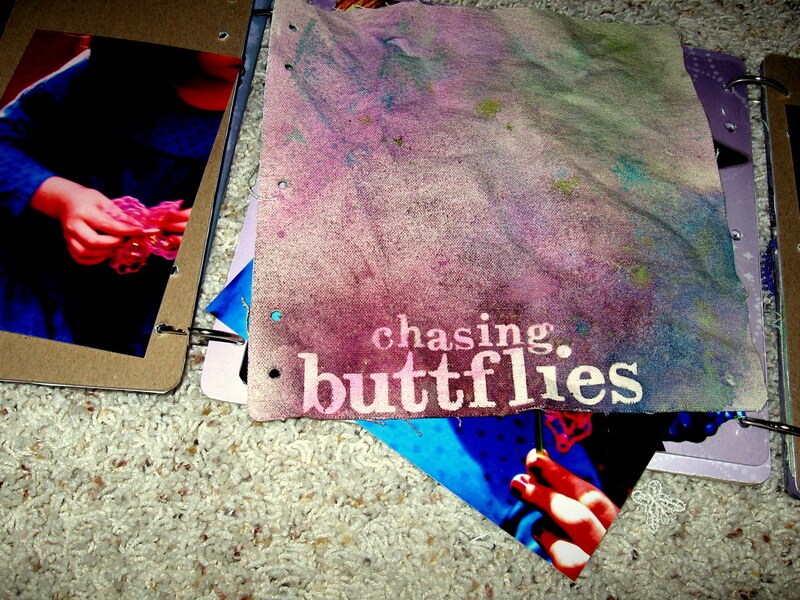 It’s a scrapbook memory in itself. I make mistakes all the time too. I’m glad that you found a way to hide yet preserve this funny memory. Yeah, you know, you might want to quit chasing those buttflies. They are real buggers.